I love making creative cakes for my kids. Minecraft is the 'Thing' right now, so I knew my 7 year old would really enjoy this cake as part of his birthday celebration. 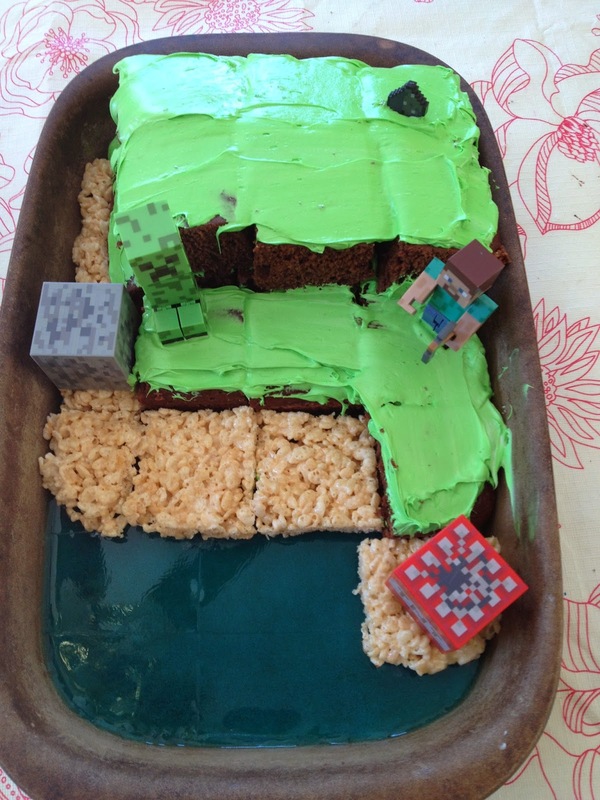 I searched Pinterest for Minecraft cakes and saw ones similar to this posted. I liked it because it was easy and effective. I made all the elements of the cake the night before the party. The base layer of the cake is blue Jell-O. I made it according to their Jigglers recipe (mix packet with 2 1/2 Cups boiling hot water, place in pan - or in this case casserole baker - in fridge to set). Separately, I made the Rice Krispie Squares and the Chocolate cake. The day of the party I put everything together. It came together quickly. 1. Slide a knife through the Jell-O to cut into squares - everything about Minecraft is block-y. The Jell-O is the water. 2. Cut the cake into same size squares - my cake cut into 16 good sized cake pieces. 3. Frost each square of the cake with green frosting as you place it out. I placed the cake pieces right on top of the Jell-O. The cake is the land. Some of the pieces of cake layers on top of each other to give it that building look of Minecraft. 4. Cut the Rice Krispie Squares into the same size as the Jell-O and Cake squares. Lay those down as the sand of the beach. 5. 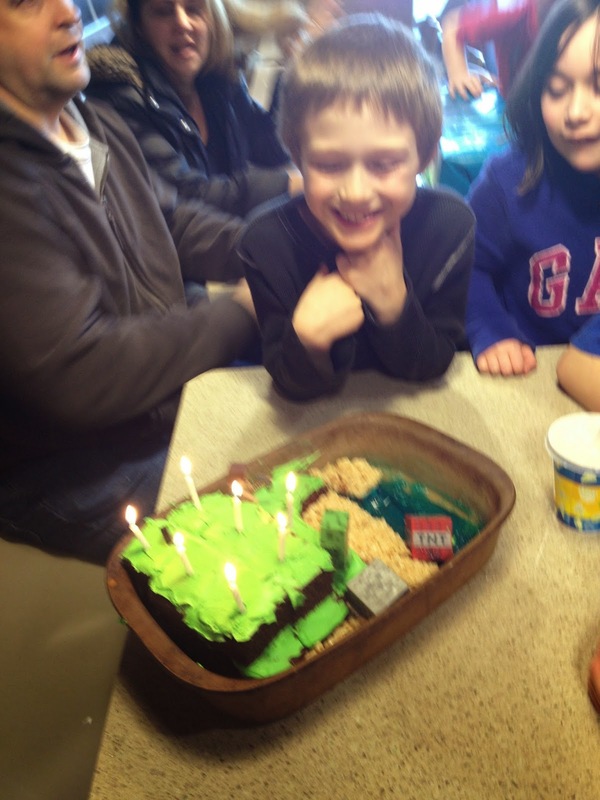 We added to the look of the cake with 2 Minecraft figures (Steve and a Creeper) and their accessories. Some people who have done a similar cake did use foldable downloads to make their figures with. The figures were part of our son's birthday present from us. Top view of the Minecraft cake ready to go to the party. It may be simple, but my son and his friend loved it! They thought it was so cool - and tasty too! My son looking on as we sang Happy birthday to him. These experiences range from 3D games and competitions, to interactive adventures where friends can take on new personas to explore what it would be like to be a dinosaur, a miner in a quarry or an astronaut out in space.